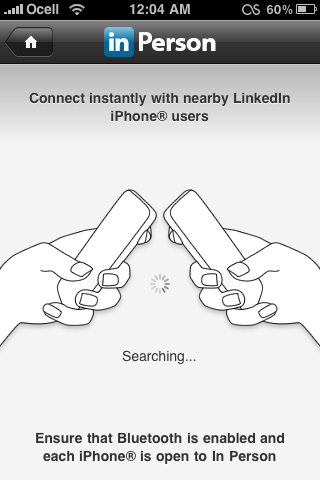 LinkedIn recently pushed out version 3.0 of their mobile iPhone/Touch app [iTunes link]. It is a complete rework of the mobile LinkedIn experience. I’ve only had a brief glance, but it already looks more useful. What I’m really excited about, though, is the inclusion of a new mechanism for connecting accounts with other LinkedIn users. Now if two people are using the iPhone app and want to connect, they can take advantage of the nearfield communication of Bluetooth to provide a handshake between the accounts, instantly connected on LinkedIn after an in-app verification. No more searching for names and e-mail addresses while you try to hunt down the account of the person standing in front of you. Now, standing in front of someone is all the context needed to establish a connection. This is how it should be. I know that this isn’t the first mobile app to use the context of proximity to exchange information. Bump and Handshake are two notable examples of applications that have done this well already. There was even IR beaming of business cards in the Palm days. However, I believe this may be the first time that a social network as large as LinkedIn has made it so easy to establish a connection with another user. I wonder how long it will be before the rest of the social media networks integrate this type of connection mechanism into their mobile experiences. I’d love to be able to follow someone on Twitter by launching Tweetie and seeing that they are close to me. If Facebook added this to their app, it would make a friend request that much more intimate and personal. For most instances of my own “social networking” I typically don’t add someone unless I have met them in person. To me, establishing a virtual connection “in real life” makes that connection that much more valuable and pertinent. I’m a fan of anything to ease the transition of an in-person meeting to an online connection.